See a collection of true (and not so true) stories of the surfers and shapers who made their mark on the history of the sport. Directed by Darren McCagh. 2017. Australia. 30 min. Russell Ord wakes one morning in Margaret River, looks over the photos he’s spent a large part of his life capturing and is filled with an overpowering sense of dissatisfaction. The shots are good and have graced the covers of surfing magazines worldwide, but deep down Ord knows he didn’t walk away from a secure career as a fire fighter to just take “good” shots. He wants to go to bed at night knowing he’s taken that “one” shot, the one he'll remember not because of the surfer's name or reputation, but for the position he had to be in to capture it. Just down the coast is a thick, evil, brute of a wave he knows will deliver the opportunity to capture just that. But as a loving husband with three kids it’s not lost on him that the end goal, and that drive to have ‘his moment', isn’t going to come without sacrifice. Directed by Lucas Jatoba. 2017. Spain / Australia. 14 min. This is the story of a man who drowned… and came back from the dead to sleep with the world’s most iconic supermodel, Twiggy. 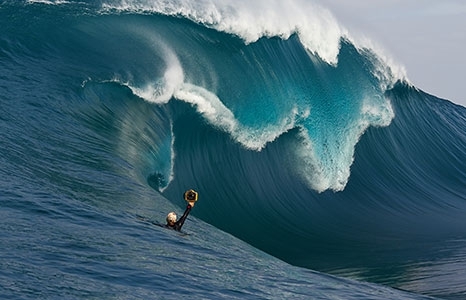 A big wave pioneer who “died more times than Jesus”, a man who constantly risked his life to find life, to find the edge or reason and overcome it. His name is Ric Friar and this is a story of Phenomenality. Directed by Eric Ebner. 2018. USA. 12 min. A secret spot in Baja California, hundreds of miles from civilization. An old milk van converted into the perfect surfing mobile. A 67-year old man, at the peak of his physical fitness, and in line with mother nature every step of the way. The Bull is the story of San Diego surfing legend Glen Horn and his journey to an unconventional lifestyle. Directed by Ross Haines. 2018. USA / Mexico. 10 min. Big wave rider and shaper Gary Linden experiments with the use of agave from start to finish in creating a new surf board. Directed by Jeremy Joyce & Rob Lockyear. 2018. UK. 30 min. The guys behind the Icelandic surf trip satire Freezing are back again with a brand new comedy. In 1979, Mike Strident built a revolutionary single fin— “The Outrider”. Strident has the world at his feet. He is the highest paid surfer in history, he’s killing it on the world tour, but then the Thruster happens. The tri-fin surfboard makes Strident irrelevant overnight and his empire crumbles. Thirty years later, Californian hot dogger, Tommy Tonata, discovers the original Outrider and tries to bring Strident back. And so begins a classic buddy story of shaping, redemption, head butts, acid trips and getting barrelled.